Describe protein synthesis and sorting from the eukaryotic genetic code. Protein Biosynthesis refers to the process whereby biological cells generate new proteins; it is balanced by the loss of cellular proteins via degradation or export. 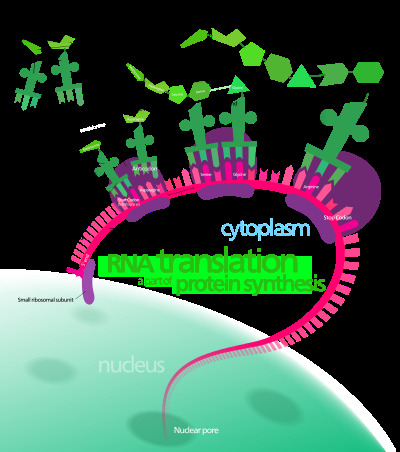 Translation, the assembly of proteins by ribosomes, is an essential part of the biosynthetic pathway, along with generation of messenger RNA (mRNA), aminoacylation of transfer RNA (tRNA), co-translational transport, and post-translational modification. Protein biosynthesis is strictly regulated at multiple steps, and error-checking mechanisms are in place. In protein synthesis, a succession of tRNA molecules charged with appropriate amino acids are brought together with an mRNA molecule and matched up by base-pairing through the anti-codons of the tRNA with successive codons of the mRNA. The amino acids are then linked together to extend the growing protein chain, and the tRNAs, no longer carrying amino acids, are released. This whole complex of processes is carried out by the ribosome, formed of two main chains of RNA, called ribosomal RNA (rRNA), and more than 50 different proteins. The ribosome latches onto the end of an mRNA molecule and moves along it, capturing loaded tRNA molecules and joining together their amino acids to form a new protein chain. Transcription occurs in the cell nucleus, where the DNA is held. The DNA structure of the cell is made up of two helixes made up of sugar and phosphate held together by hydrogen bonds between the bases of opposite strands. The sugar and the phosphate in each strand are joined together by stronger phosphodiester covalent bonds. The DNA is "unzipped" (disruption of hydrogen bonds between different single strands) by the enzyme helicase, leaving the single nucleotide chain open to be copied. RNA polymerase reads the DNA strand from the 3-prime (3') end to the 5-prime (5') end, while it synthesizes a single strand of messenger RNA in the 5'-to-3' direction. The general RNA structure is very similar to the DNA structure, but in RNA the nucleotide uracil takes the place that thymine occupies in DNA. The single strand of mRNA leaves the nucleus through nuclear pores, and migrates into the cytoplasm. The first product of transcription differs in prokaryotic cells from that of eukaryotic cells, as in prokaryotic cells the product is mRNA, which needs no post-transcriptional modification, whereas, in eukaryotic cells, the first product is called primary transcript, that needs post-transcriptional modification (capping with 7-methyl-guanosine, tailing with a poly A tail) to give hnRNA (heterophil nuclear RNA). hnRNA then undergoes splicing of introns (noncoding parts of the gene) via spliceosomes to produce the final mRNA.. 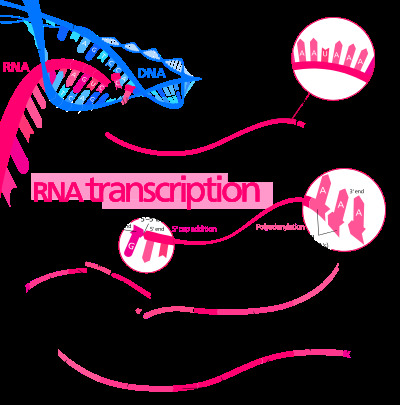 The synthesis of proteins from RNA is known as translation. Translation occurs in the cytoplasm, where the ribosomes are located. Ribosomes are made of a small and large subunit that surround the mRNA. In translation, messenger RNA (mRNA) is decoded to produce a specific polypeptide according to the rules specified by the trinucleotide genetic code. This uses an mRNA sequence as a template to guide the synthesis of a chain of amino acids that form a protein. Translation proceeds in four phases: activation, initiation, elongation, and termination (all describing the growth of the amino acid chain, or polypeptide that is the product of translation).